If you have lost a tooth or have had a recent extraction, a dental bridge can replenish the gap, restoring your mouth back to full dental function. 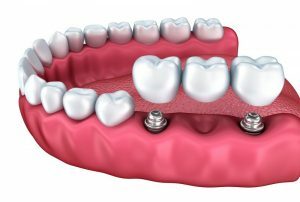 At Northway Dental Practice, we are extremely experienced in building and fitting bespoke dental bridges which is a long lasting, natural looking solution for missing teeth. In its simplest form, a dental bridge is a prosthetic or artificial tooth. It is built by our laboratory and is colour-matched to your natural teeth so that it blends in. A dental bridge is supported on either side by crowns. The crowns are fixed to the adjacent teeth and work to ‘anchor’ the bridge into place. The prosthetic tooth then ‘bridges’ the gap left by the missing tooth. We offer a variety of solutions for replacing missing teeth and when you visit the practice, your Northway Dental practitioner will advise which option is most suitable for you. Please click here or call 0151 526 2701 to book an appointment now.